critique Archives - Make Time. Regarding Feedback: Why you don’t have to have thick skin. Yesterday a writer friend asked my advice on an awkward situation he’d gotten into where he’d given another writer feedback that was not well received. Shocked by the negative emotional response, he wondered what he’d said or done wrong. I’m not going further into that story. It’s his story to tell or not tell, but his bringing me into the question about feedback helped me solidify my own ideas, ideas I’d been mulling over for a long time. There seems to be a pervading myth that if we want to be taken seriously as writers, we have to develop thick skin, be open to receiving feedback from anyone and not take it personally. I reject this notion. Even considering other questions, such as when a piece is ready to be let go and be commented on by others. Receiving feedback prematurely from anyone is a risk. I wrote a short letter about that a while back after handing a trusted editor a story that had just been born. Yet, I believe, even when you have worked your piece to a vibrant gleam, you do not have to be thick skinned regarding your work. You shouldn’t be. 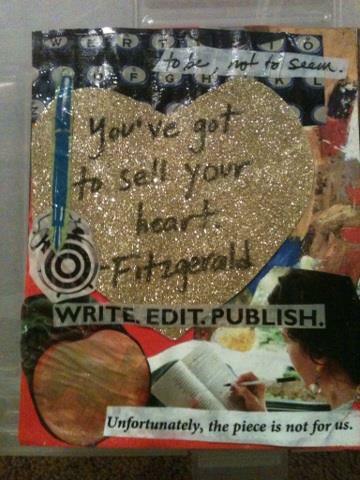 Fitzgerald said that as a writer “you’ve got to sell your heart.” This is validated in everything I know about the writing process. The way we slip into the skins of our characters in order to feel what they feel. The way we weave a story in time and space into strands of universal meaning. The way we work and work arranging and rearranging words. Why should we have to be willing to give our hearts away to anyone? The best critiques I’ve gotten are from friends who are truly interested in helping me become a better writer and who understand that I know my work needs work and, from them, I’m willing to hear some possibilities as to how I might go about improving that work. I’m in a critique group now with writers I know and trust, and I feel grateful for that. During the MFA program I graduated from in 2011, we were placed in random workshop groups with people who we often didn’t know, sometimes didn’t trust. I think these types of feedback groups are the worst idea ever. You give everyone in the group your heart and trust that they like you, aren’t the type of person who is more worried about impressing a faculty facilitator than helping you, and is wise enough not to allow their own aesthetic bias to seep into their comments. Now, you might say one ought to be prepared to take that kind of feedback too, especially if the plan is to get the work out into the world where anyone is free to stomp on it as they please. 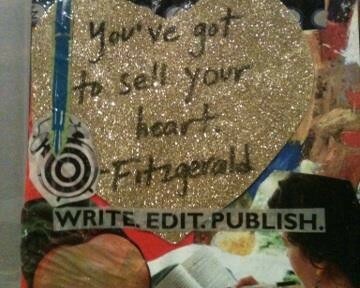 But a work sent out into the world is a finished work, you’ve let it go. A work you’re working on should be shared with only people you trust. Believing that thick skin garbage was easy for me. I’ve spent a life time learning to toughen up. Being vulnerable is human and necessary. You do not have to be thick skinned to be a writer. This entry was posted in Critique, On writing and tagged critique, writing, writingadvice, writingcritique, writingfeedback, writingfiction on 2015-07-08 by lizshine74.